Pantone's perky purple is serving up some serious design inspo for 2018. This surprising, saturated dining space is lending us all kinds of design inspiration. 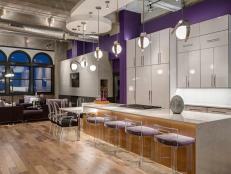 Get the look at home by pairing this purple with classic furnishings and neutrals like brown or ivory. We believe vibrant violet is the perfect hue to serve as the backdrop to your most vibrant conversations. Queue the swoon! 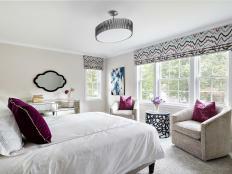 We’re enamored with the cool-tone color palette used in this chic guest bedroom. Soft, violet walls appear effortless behind the soothing, sky-blue bed. 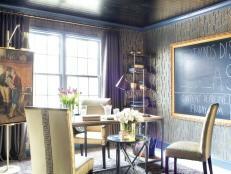 Graphic, black and white touches and metallic accents add an extra touch of style and sophistication to the space. Color your kitchen! Fast fact: purple once represented royalty. Add a fresh coat of this rich hue to your cabinetry, and you’ll be one large, salt-preserved turkey leg away from feasting like the kings and queens of years’ past. 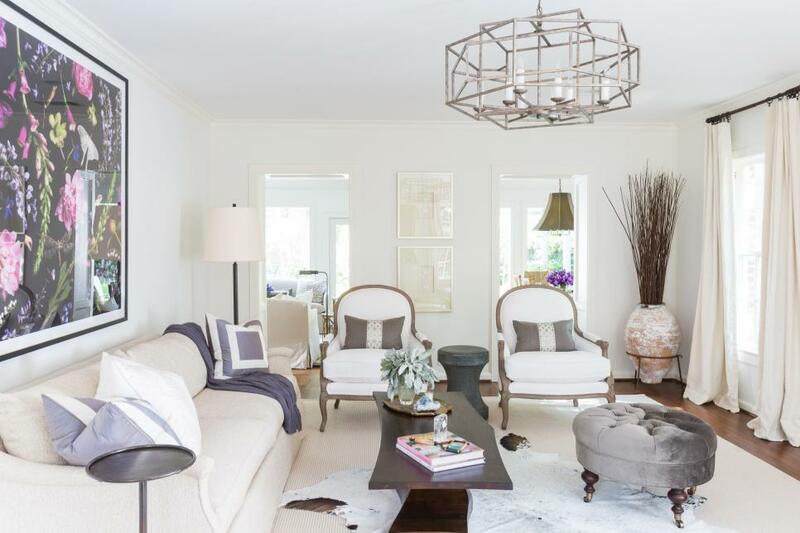 This sun-drenched parlor is outfitted in various shades of gray and white, leaving the space feeling light and bright. Thoughtful touches of ultra violet are used via plush pillows, accent furniture and artwork to add warmth and distinction to the design. There’s no time like the present to play with purple, peeps. Pretty lilac walls ofer a softer alternative to vibrant ultra violet while still creating an energized space for your tiny tots. What’s better than a built-in focal piece in a space, right? Vivid, violet tiles create a striking fireplace that’s guaranteed to spark a conversation or two. A crisp, classic mantel and canary chair are easy, eye-catching complements to the stunning surround. Though vivacious and bold, violet is also capable of supreme sophistication, you know. 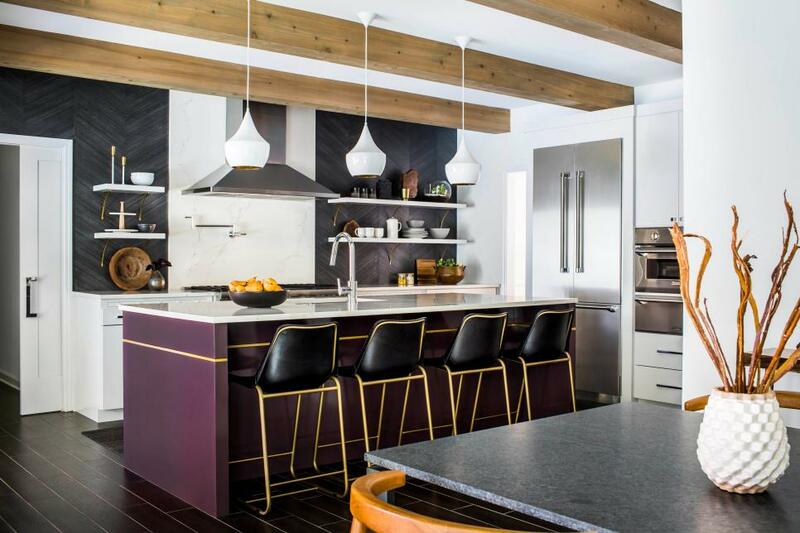 Deep violet, steely gray and a mixture of luxe patterns and textures work in tandem to create an unmistakably high-end design. 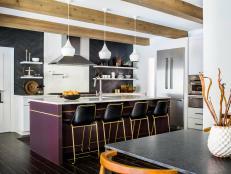 This oversized loft kitchen is on trend in every way. Outfitted with a line of velvet-seat ghost chairs, pendant lighting and a lively coat of violet on the walls, this space is fit for easy entertaining and living alike. 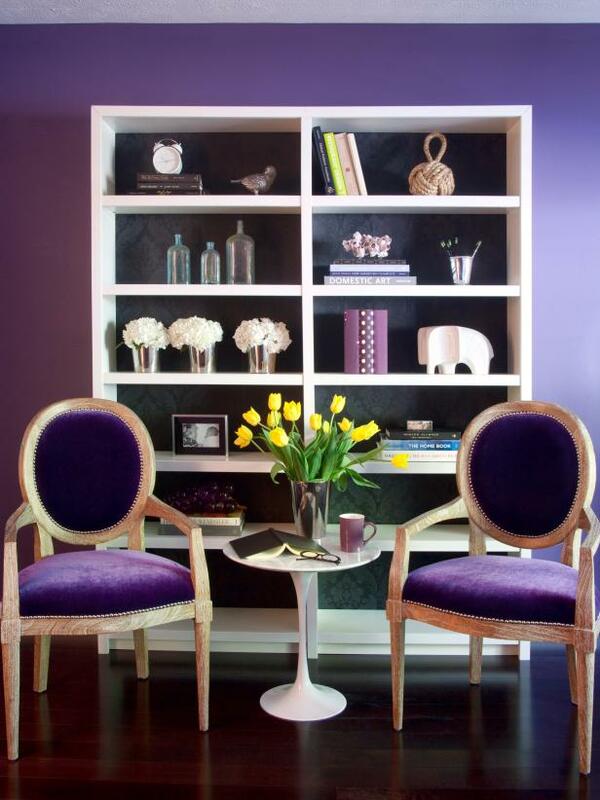 Incorporating ultra violet into an eclectic interior is a no brainer when it comes to updating your space for the new year. 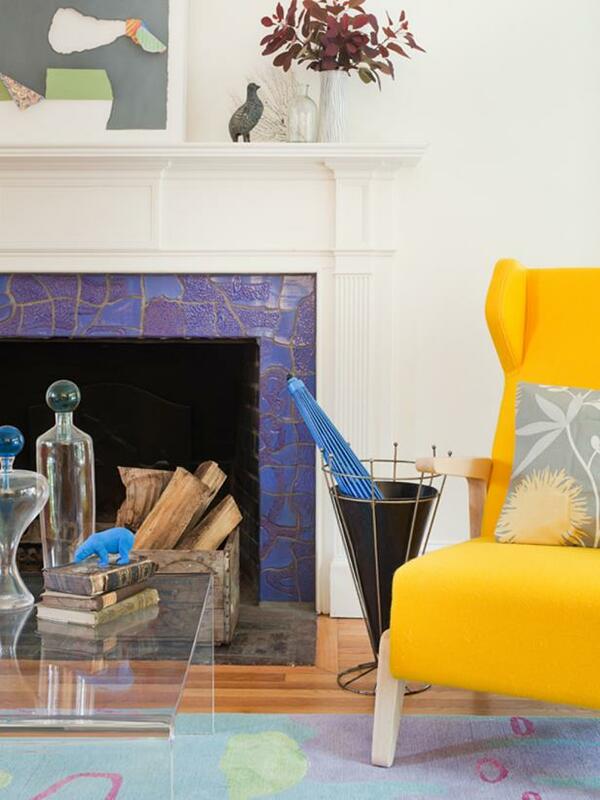 Take note from this funky, fun-loving living room! 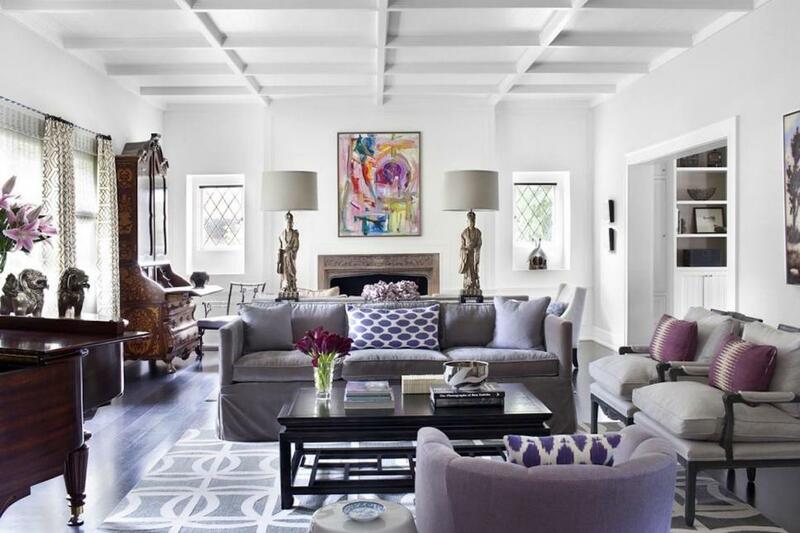 Search for an oversized, purple-clad piece of art to enliven your walls. Brown, white, gray, black... and violet? Yes. Tone down the spirited shade, and use it as a surprising new neutral that loved ones will want to imitate in their homes, ASAP. It's true what they say: sometimes less is more. Silvery gray and violet are the sumptuous accent colors in this sitting room and act as an elegant, fresh pairing with all the room's white. Sensual and sophisticated, wouldn’t you agree? 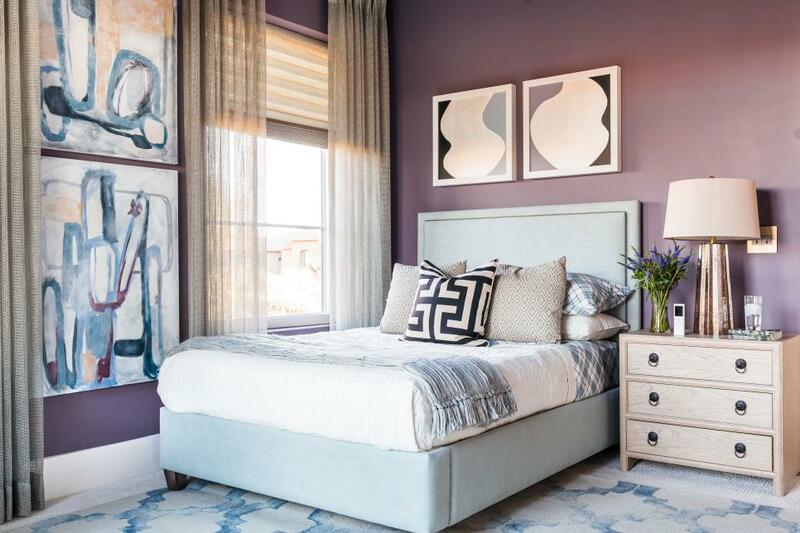 A moody mix of violet and smoky, neutral hues are used in this master bedroom to create a romantic retreat for homeowners at the end of each day. 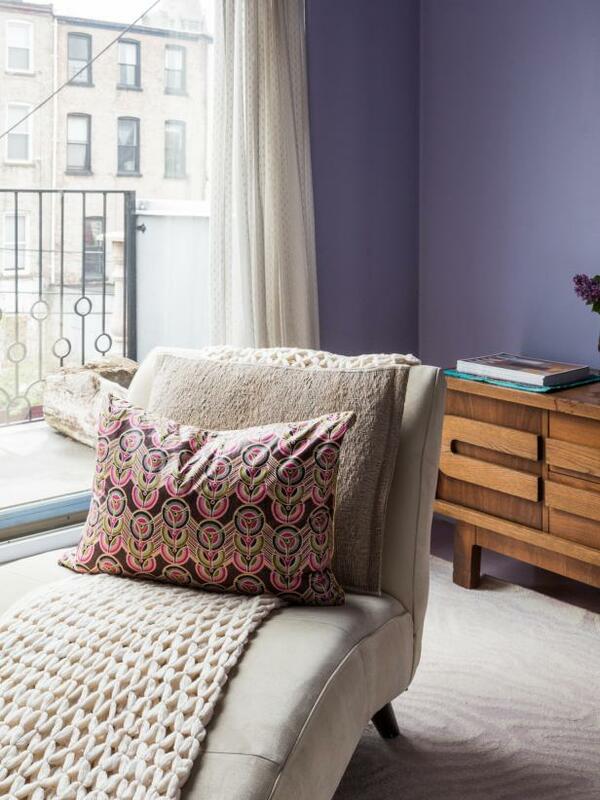 The violet walls are toned down with an elegant, wheat chaise and natural wood furnishings throughout. A traditional cream throw blanket and fiery paisley pillow even out the cool hue and create a cozy spot to catch up on nightly reading. A word to describe this bedroom? Posh. 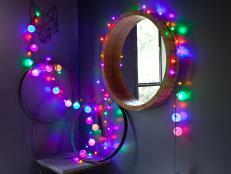 Small touches of brilliant pink and ultra violet make all the difference, energizing the otherwise white and gray space. Talk about eye candy, right? This contemporary living room leaves us breathless with its smoky gray furniture, crisp white casings and fifty shades of violet throughout. It’s easy to love the monochromatic moment happening with this guest room bookshelf. We're encouraging you to take this trend head on! Create a similar corner in your home by layering violet-on-violet focal pieces and accessorizing with bright white accents. 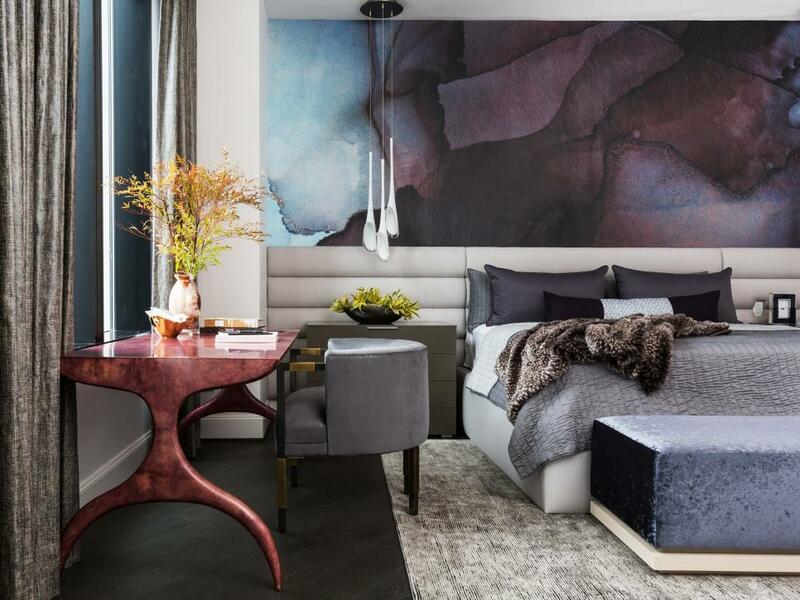 There’s something decadent about this deco-inspired bedroom design. 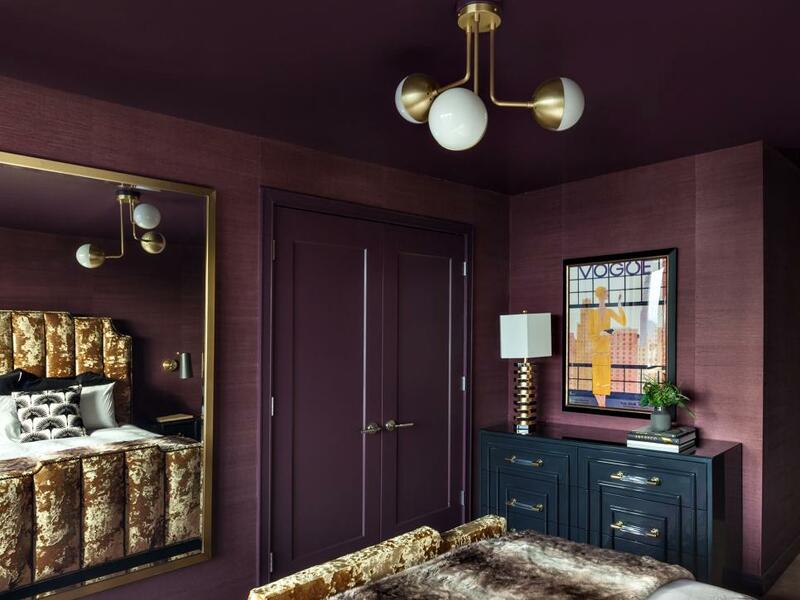 Recreate the glamour in your home boudoir with a darker, sultry shade of violet paired with lots of gleaming, gold accents. 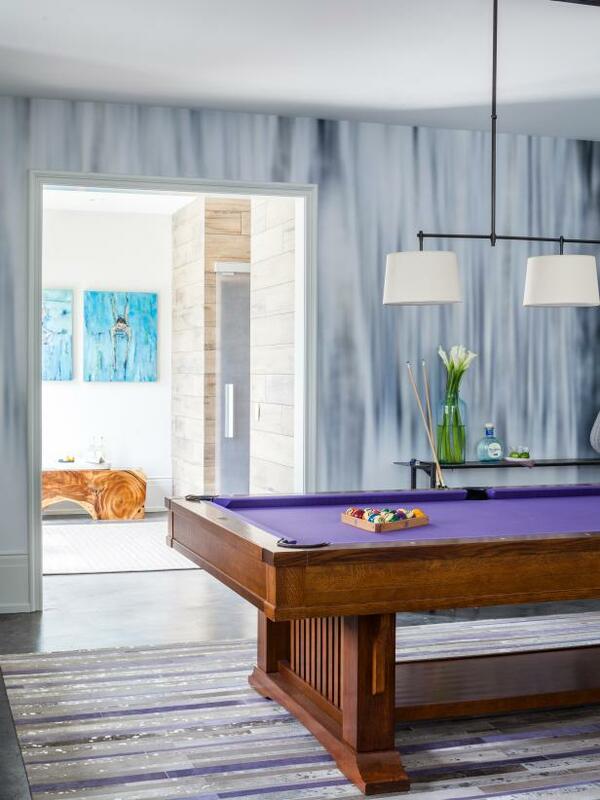 It's easy to play it cool in this sophisticated game room where the pool table is purple and every detail is thought out. 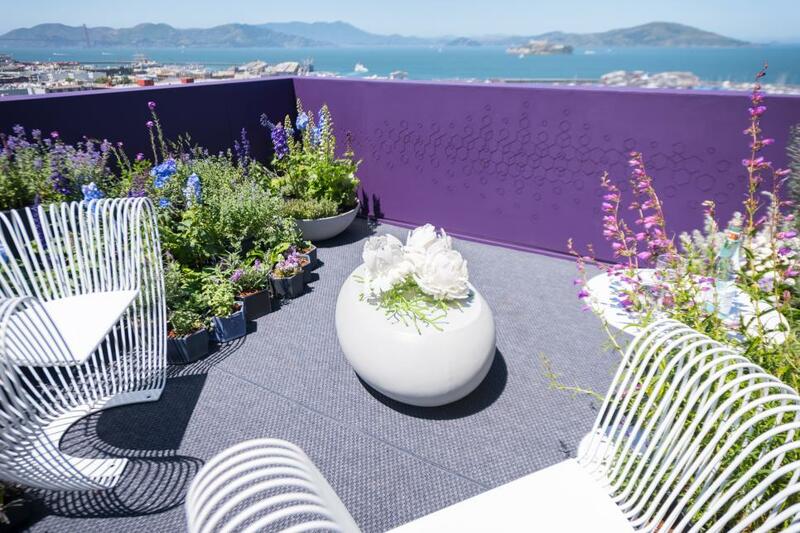 It’s hard to beat that view, but this violet-clad terrace is giving the sparkling San Francisco bay a run for its money. Why not create your own view? 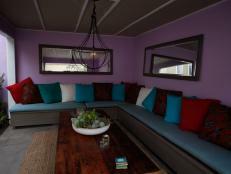 Add a pop of ultra violet to your outdoor living space, around your fire pit or along your garden wall.